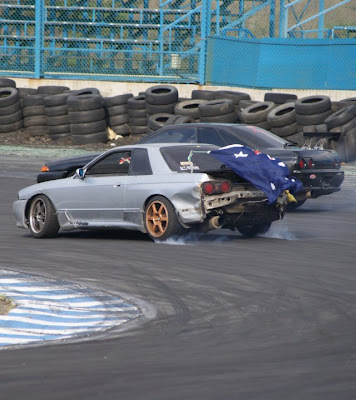 After the success of the first G1GP round last year at the Fall Drift Matsuri, the Gaijin Only drift series has continued, bigger and badder into 2010! 15 drivers, mostly ‘Fair Dinkum Australians’ entered the Spring 2010 G1GP which was held on Friday 30th April at Ebisu South course. We decided to run the G1 competitions on the Friday, the day before the matsuri weekend while the cars are still in working order. The G1GP kicked off with practice from 8am to 12pm, then the 3 single qualifying runs starting at 1:30pm. Judging was done by none other than Kumakubo and Suenaga from Team Orange. Seeing as there were only 15 cars, everyone could get through to the Top 16.. well actually Top 15! To no-ones surprise, Andy Gray from Powervehicles laid down near-perfect qualifying passes in his red JZX90 and became top qualifier. 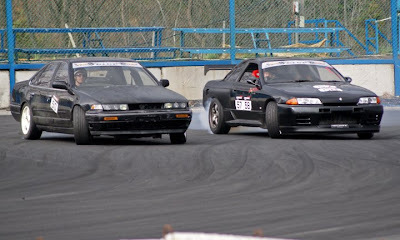 Chris DeJager in his black zenki S14 qualified 2nd and Alexi Smith in his white JZX100 qualified 3rd. Myself, Disco Stu, stuffed the warm up lap, nudging the tire barrier right in front of the two judges and the first qualifying lap by spinning on the last corner and just missing the wall. But managed to qualify 5th place, to my surprise. For some reason, the judges were worried about the tandem drift battles! Maybe they were expecting some carnage. To be honest I think we all were a little. There were some close calls but nothing too dramatic to report of. Everyone stepped up for the battles and put on a good show. Andy and Chris were blitzing through all their battles and they were matched up head to head in the final tandem run. Andy came away with 1st after Chris made an unfortunate spin in the first corner a skillfully missing a hit from Andy and the tire barrier. 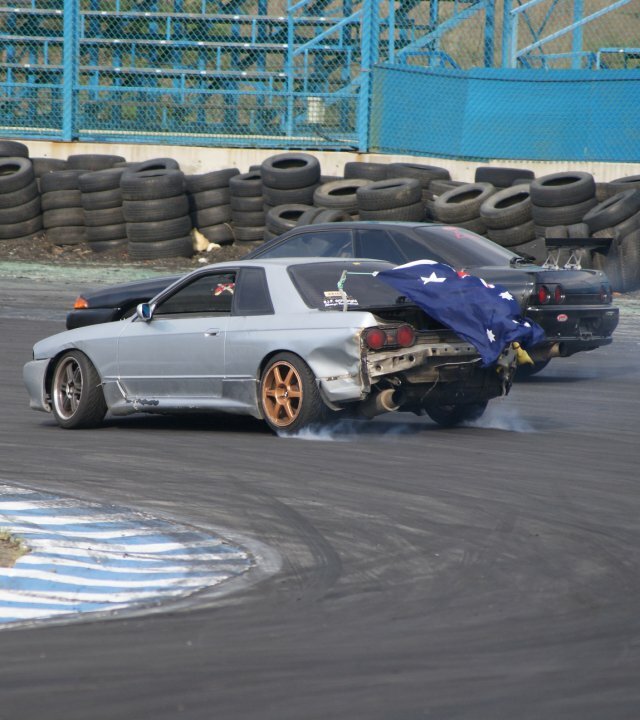 All the Aussies still couldn’t beat the mad Scot Andy in his red JZX90 smoke machine! Congrats Andy and all the drivers! After the award ceremony, we celebrated another successful and super fun G1 and finished off the day with a succulent wa-gyu beef BBQ and some beverages to wash it down with, courtesy of Team Orange and Ebisu circuit. 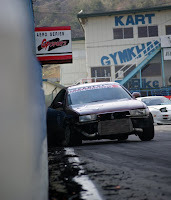 When Is The Next G1GP? The next G1GP will be held on the Friday before the Summer drift matsuri – August 20 2010! 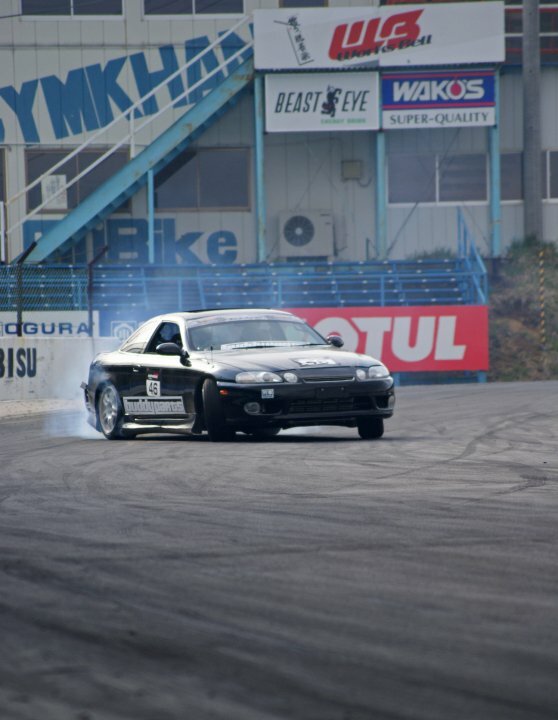 The course of choice – Ebisu West drift course. Any gaijin (foreginer) with a car and helmet can enter. Entry fee is 15,000 yen (approx US$160). Includes insurance, G1GP windscreen banner sticker, prizes if you win) and maybe another BBQ! For more info, please contact me (leave a comment, connect on Facebook, or email me) or Andy at Powervehicles.com. 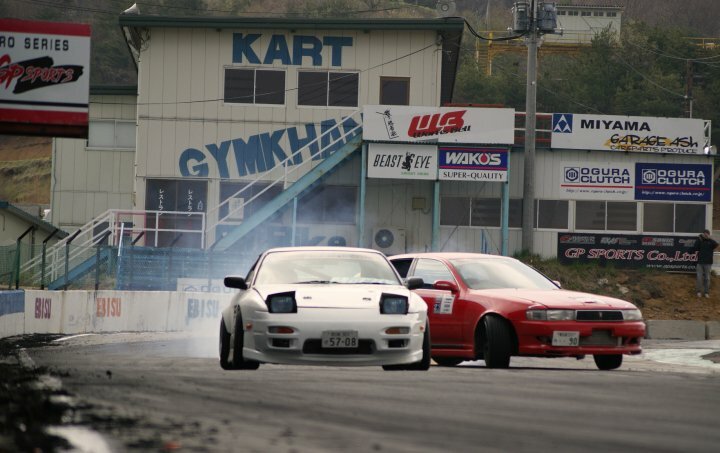 We can arrange a car for you to purchase and use in the G1 and drift matsuri. 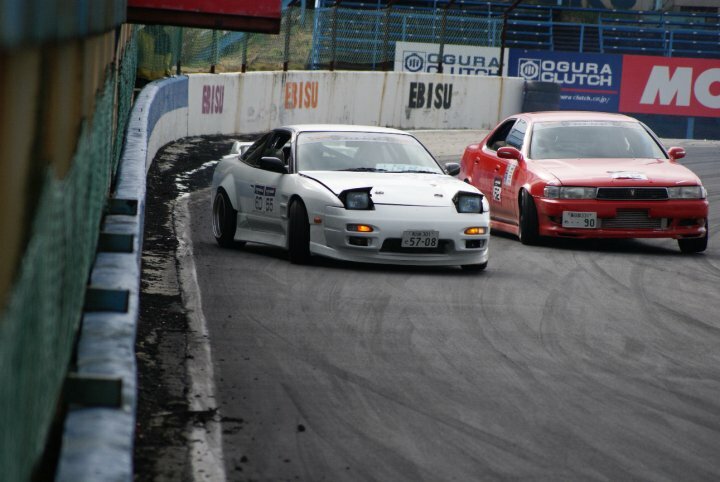 Many thanks to Kumakubo and Suenaga from Team Orange for making G1GP an event to remember. 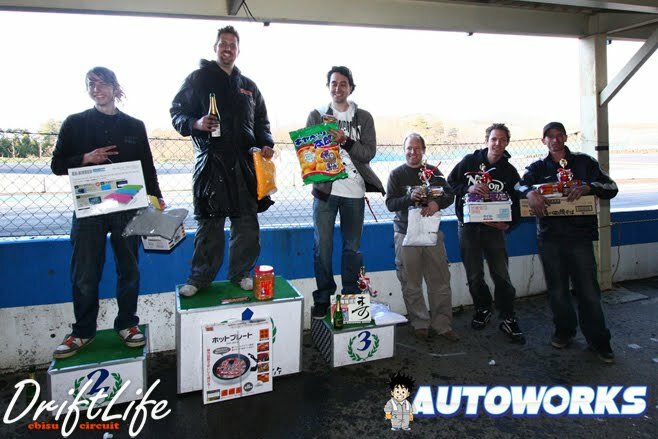 Thanks to Andy from PowerVehicles.com for helping most of the entrants. Thanks to Daniel Johnson (DJ) for photos and the un-named camera man for taking the videos and uploading to YouTube. Hope to see you in Summer for the next G1! p.s. The soundtracks to these videos absolutely rock! I had neither car nor DSLR that day! Looking forward to catching up with you guys again in Summer – just have to find a JZX90 this time around! 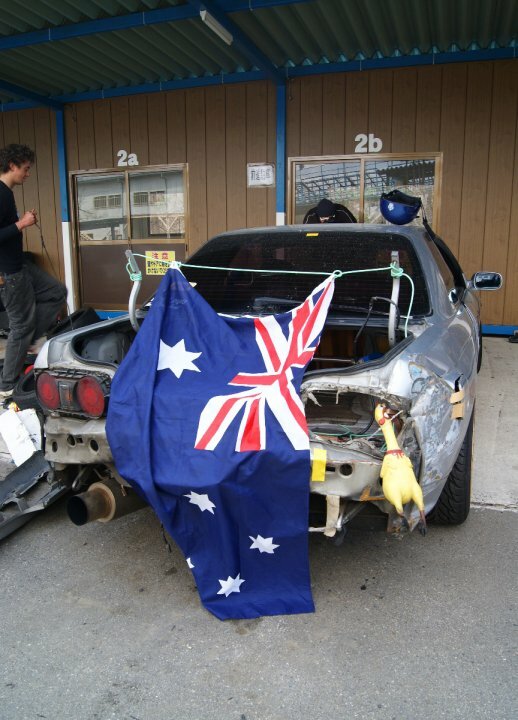 That reminds me – do you know how I can get in contact with the guy who drove the purple JZX90 at the G1GP? I have forgotten his name!